In order to meet requirements of the clients in effective manner, we bring forth the best Platforms Steps. 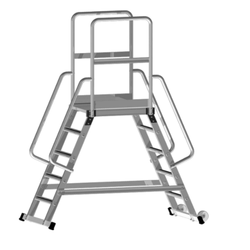 Under this range, we offer Folding Mobile Platform Ladders, Mobile Platform Steps, Single Sided Access, Single-Sided Platform Steps and Double-Sided Platform Steps. 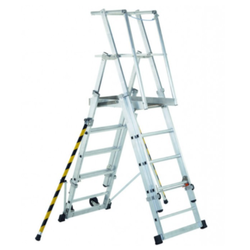 Furthermore, we offer ZAP Telescopic Platforms, Platform Step Ladders, ZAP Platform Steps and ZAP Work Platforms. These aforementioned products are manufactured using high-grade basic material, procured from the accredited vendors of the industry. Designed to perfection, these offered products are featured with longer service life, high compressive strength and resistance against corrosion. 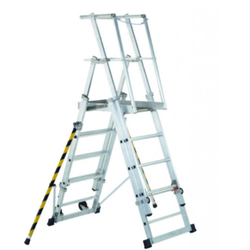 We are a prominent name engaged in offering the best range of Mobile Double-Sided Access Platform Steps. Fabricated by making use of high-grade basic material, these products completely adhere to the established norms of the industry. Our valued clients can avail these products in different sizes and specifications as per their requirements. We have in our stores a wide assortment of Double-Sided Platform Steps for the valued customers. Responsibility of manufacturing these products lies on the shoulders of our professionals. Our team members manufacture these steps using supreme quality basic material in complete adherence with the defined parameters of BGV 694 and BGI 637-2004.Furthermore, to meet diversified demands of the clients, we offer these products in different specifications and sizes. ZAP Platform Steps offered come with width of cantilever set at 0.75 mm and length of cantilever set at variations of 1.80 m; 2.50 m; 3.00 mm. These platform steps also allow addition of the extensions to any side at any height as well as in any combinations. Its usage allows creation of number of workstations on single scaffold and have enhanced load bearing capacities of 150 kg/m2 when cantilevers are used. Further, the maximum platform heights are limited to 8 m outdoors and 12 m in fully enclosed spaces. Our firm is one of the renowned and coveted manufacturer and supplier of a wide range of PlatformSteps. 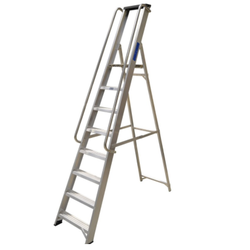 Widely used as for stationary access by a platform, this range has been developed as per the quality standards. Passed through various quality checks at every stage of production, this has always let us ensure that we maintain high industrial standards. Looking for Platforms Steps ?